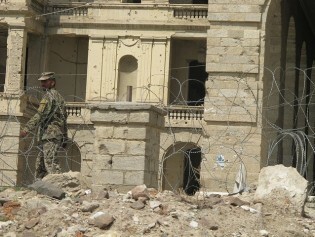 Western fears of a civil war in Afghanistan are growing ahead of the scheduled pullout of international troops in 2014. However, experts here say the situation on the ground is not comparable to either 1988, when the Soviets withdrew from the country, or the mujahideen’s rise to power in 1992, which plunged the country into civil war. In the last eight years Afghanistan's precious stones and artifacts have been pillaged at record levels. Thieves, both foreign and domestic, often steal the riches from under the noses of officials. After the fall of the Taliban, the most widely recognised and praised Afghan film has been 'Osama'. Directed by Sediq Barmak, the 2003 production is the heartrending story of a young girl who disguises herself as a boy named Osama so that she might survive the Taliban regime. Osama received awards at both Cannes and the Golden Globes. A Taliban fighter infiltrated the Afghan police force, killing seven Afghan officers and British soldiers. Similar attacks have taken the lives of U.S. troops. Niamatullah joined the Afghan National Police (ANP) for the same reasons that many Afghan men do. For the last three weeks, 30-year-old Ghulam Nabi has lain in a Kabul hospital bed, suffering. His face is etched with hopelessness, loneliness and despair over the life he once had and has now lost forever. Partial results in Afghanistan's presidential polls tend to favour President Hamid Karzai with Abdullah Abdullah, former foreign minister, trailing in second place. Kabul lawmaker Ramazan Basherdost who is at third place, seems to have garnered more votes than former World Bank economist, Dr. Ashraf Ghani. Afghanistan's Independent Human Rights Commission says that in the last seven months they have received 12 complaints about stolen land. The complaints cover the map, ranging from Wardak, Panjsher and Kapisa, to Parwan and Kabul. Afghans are queuing up Thursday to vote in an election that could give President Hamid Karzai a second term. Still, many among them could be wondering if democracy is working for the majority of people.